Tappets. That’s what I’ve heard is a common cause for the noise. From what I’ve learned, the tappets shouldn’t make noise if there’s enough oil and oil pressure around them. Cam chain. I’ve heard this could be slapping around. Before I took the bike off the street to restore it, in addition to the tapping, the oil light was flickering. It seemed to come on most frequently when the bike was idling, and went away (for the most part) after accelerating. The dipstick in this bike was missing the stick. I figured it fell into the oil and got crushed by the motor. I thought the remains may have clogged the oil pump strainer. So I dropped the oil pan to check it out. My theory was that the clogged strainer could have caused a reduction in oil flow/pressure and therefore have caused the tapping noise to get worse. The strainer was clean but there were some pieces of something relatively solid in the bottom of the pan. One of the pieces looked like it could possibly have been metal. Don’t want to think about that to be honest. So, what should my next step be? Should I take the top end off? 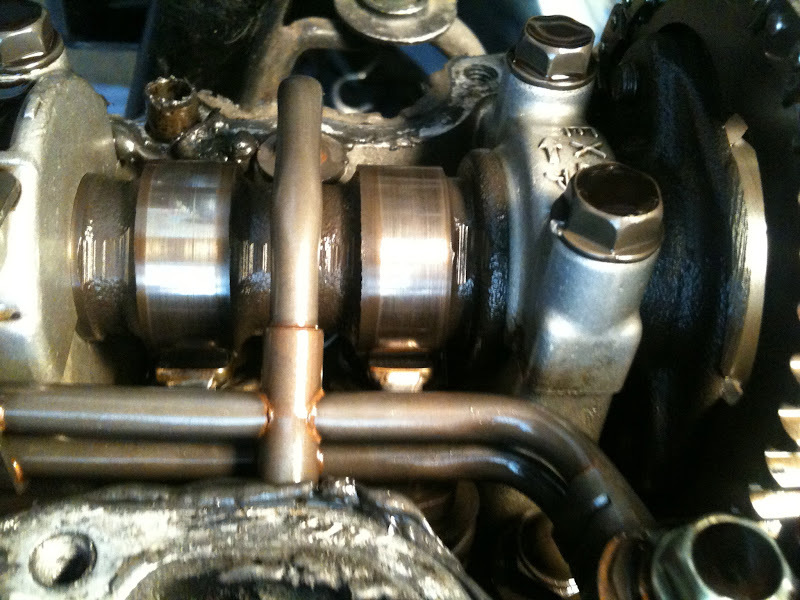 Tappets will always make some noise, but it should not be distinctive or loud. If it is a rattling/slapping sound it could be a wearing cam chain, chain guides, or tensioner. If it’s a distinctive tap tap tap then it could be a damaged valve guide or slightly bent valve. If your cam chain slack is adjusted, and your valve clearances are in check, then it’s time to pull the valve cover and start looking around. If you can’t spot the problem there then you may have to pull the head. Do your best to locate the source of the sound. Rest a flathead screwdriver against different parts of the top end while running and put the handle to your ear. The screwdriver will work as a rudimentary stethoscope to help you pinpoint the location of the sound. Here’s a video I made just before I started taking the bike apart. You can hear for yourself. Let me know if this helps to narrow things down. Meanwhile, I’m going to try to figure out what kind of rig I can put together to let me work on the motor without putting the whole bike apart. If you have any suggestions there I’d love to hear those as well. It sure doesn’t sound healthy. Sorry mate. Sounds like a valve issue to me. Could be a broken guide, bent valve, or broken spring. Pull off the valve cover and see if you can spot anything. Check the valve clearances before you go as far as pulling the head off. If you can handle a big mess – With the valve cover off, remove the spark plug wires so the bike can’t start, then hit the starter. Oil will fling everywhere as the cams spin, but the sound will be more audible with the cover off and you should be able to determine the location. I took the valve cover and oil filter off. In the oil filter I didn’t find anything that seemed major to my untrained eye. There was a little bit of grit in there. But it was really a little bit, and I really don’t think it was metal. Now the bad news. Here are pics of what I found under the valve cover. The right hand exhaust-side of the motor was clearly cooked. The other three corners of the motor looked fine. 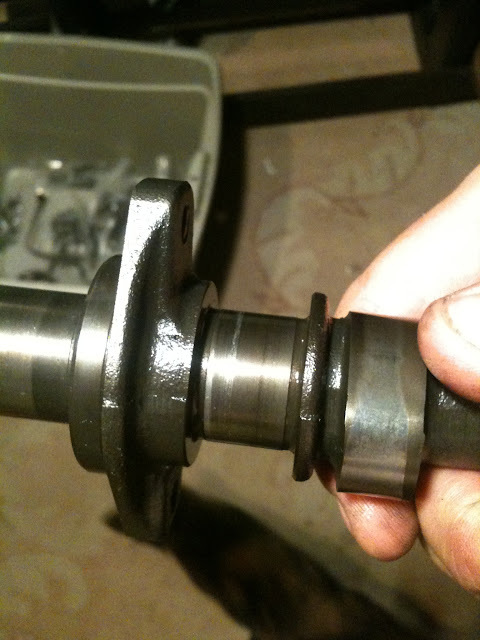 Here’s a couple of pics which show the two camshafts. 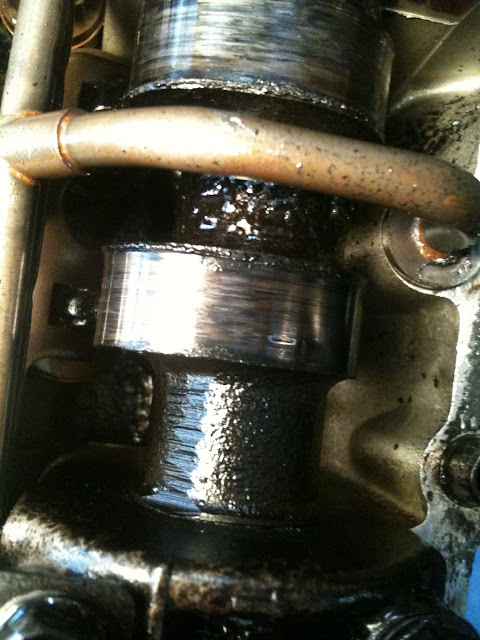 The second piece of bad news is that I saw what looked like a small mound of dirt or gunk near the center of the motor, between the camshafts. I don’t know what it is. So, what are my options? What’s in order to get this motor back in order? There’s similar scoring in other spots, but not quite as much. One last thing I noticed is that the part in the top-middle of this photo (which isn’t numbered and therefore not named in the schematic on bikebandit) is bent up a bit. Sorry for the slightly fuzzy photo. The other three seem to be fine (straight). So, A) what’s the part called? And B) is it really bad that the part is bent? I’m pretty sure it can’t be good or even normal. So, I’ve been doing all of the work on the bike myself to this point. The motor is clearly going to be a project unto itself. Anyone know any good books on engine rebuilding? I know of a motor for this bike for sale on ebay for $50. It’s in unknown condition with unknown mileage. Would it be a good move to buy it? The bottom line question here is, can this bike be fixed? It’s a rare model. Honda only made the DOHC motor for one year. So parts for the most part have to be scavenged. NOS/OEM parts are nearly impossible to find, at least they have been so far. Yep, that cam is TOAST! When was the last time the valves had been checked on this bike, I bet they were SUPER tight. I would also be very suspicious of your oiling system. If your light is coming on like it shows in the video then you may have a partially clogged line, or the oil pump may be slightly damaged. Either way you are going to have to do some testing with the oil system to make sure flow is adequate. Your next step is removing the cams from the head. I’d bet that your cam journals and valve caps are toasted too, but you never know, you might get lucky. Pull out the cams and give them a look. Putting silicone around the valve cover is very common and is only a problem if it gets into places where it shouldn’t be. 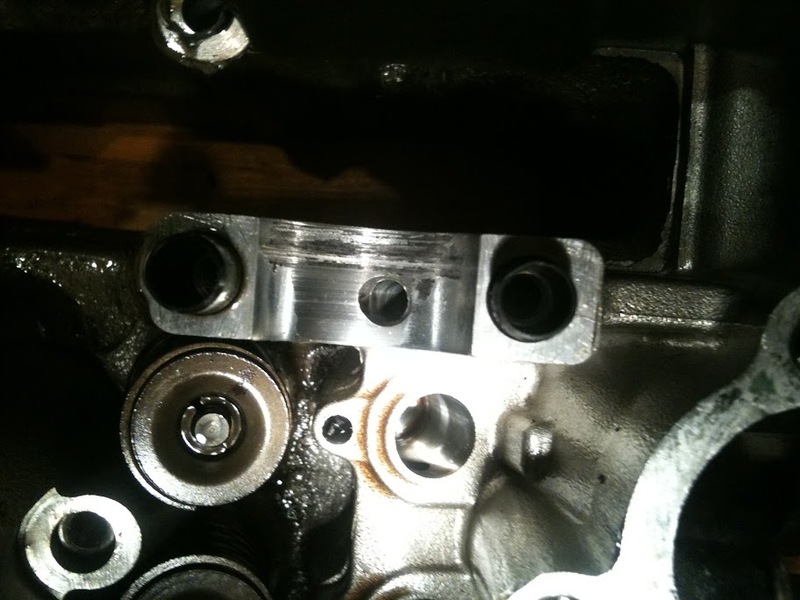 I often use a VERY thin layer around my valve covers to prevent seeping. Your previous owner certainly used quite a heavy amount. Yes – Jump on that parts motor for $50. One way or another you are going to need some parts! $50 is cheap, and even if the motor turns out to be beat, you can sell off some of the good parts and double your money. Gonna pick up the parts motor this weekend. Is the scoring on the camshafts something I should worry about? Yes, that camshaft is going straight into the garbage. Or hang it on the garage wall! The other shaft looks OK but I would pull it out and give it a close inspection. You’ll also want to take a very close look at the cam journals. If there has been a oil starvation issue then the journals will show the effects. So here are some pics from the new motor I bought this past weekend for $50. How does the wear look on those cams and journals? There’s one that I’m a bit concerned about. How bad really is the damage? Looks like the cam just has a couple very light scores on it. Can you feel them with your finger? From the photos it looks like it’s serviceable. The journal however doesn’t look so good. If you have a shop that works on motors nearby you might bring the head down to them and ask if they do repairs and how much they’d charge – but likely the repair would cost more than finding a replacement head on eBay. If it were me, and this was just an around town bike that I was tinkering with, I would be tempted to just put it back together using the best parts and see how much life I could get out of it. However, if you want a long term reliable bike, don’t do this. The scoring in that journal will only get worse, and eventually something will fail. So the scores in the cam aren’t noticeable to the touch. And the journal, that looks like a baby version of what I found in the bad motor. So, I don’t feel very good about the idea of just putting everything back together and hoping for the best. I’m glad you told me that you’d just slap it back together though. It gives me a little counterpoint to what I keep reading about how incredibly delicate the engine components are (gotta be put back in the exact same spot, wear patterns and such). Now, if I did get a replacement head on ebay, would it be appropriate to put the existing cam (possibly after a bit of work) into the replacement head? Would wear patterns or whatever cause problems? Yes, make no mistake about it, if you reassembled using that head with the scores in the journal, it WILL fail. The question is how long it will take, and how much other damage it would do. If little metal shavings found their way into the bottom end it could kill the whole motor. If you intend to ride this bike for a while, search out a replacement head that is nice and clean. You can part out your $50 motor to make that $50 back and enough to cover a replacement head.